Meet the Magnificent Cayton-Hollands, a trio of brilliant, acerbic teenagers from Denver, Colorado, who were going to change the world. Anna, Adam, and Lydia were taught by their father, a civil rights lawyer, and mother, an investigative journalist, to recognize injustice and have their hearts open to the universe—the good, the bad, the heartbreaking (and, inadvertently, the anxiety-inducing and the obsessive-compulsive disorder-fueling). Adam chose to meet life’s tough breaks and cruel realities with stand-up comedy; his older sister, Anna, chose law; while their youngest sister, Lydia, struggled to find her place in the world. Beautiful and whip-smart, Lydia was witty, extremely sensitive, fiercely stubborn, and always somewhat haunted. She and Adam bonded over comedy from a young age, running skits in their basement and obsessing over episodes of The Simpsons. When Adam sunk into a deep depression in college, it was Lydia who was able to reach him and pull him out. But years later as Adam’s career takes off, Lydia’s own depression overtakes her, and, though he tries, Adam can’t return the favor. When she takes her own life, the family is devastated, and Adam throws himself into his stand-up, drinking, and rage. He struggles with disturbing memories of Lydia’s death and turns to EMDR therapy to treat his post-traumatic stress disorder when he realizes there’s a difference between losing and losing it. Adam Cayton-Holland is a tremendously talented writer and comedian, uniquely poised to take readers to the edges of comedy and tragedy, brilliance and madness. 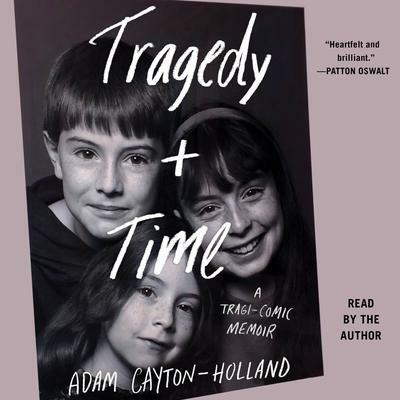 Tragedy Plus Time is a revelatory, darkly funny, and poignant tribute to a lost sibling that will have you reaching for the phone to call your brother or sister by the last page.